His 40th birthday party caused uproar when he ate sushi off half-naked models. His 41st was no less colourful or provocative. Flamboyant South African businessman Kenny Kunene celebrated by dressing up as one of his idols, Muammar Gaddafi, in a flowing cream robe. He surrounded himself with six models wearing camouflage-pattern bikinis and brandishing fake AK47 rifles – an apparent reference to Gaddafi's infamous "Amazonian guard". The multimillion-rand celebrations, held last week in Alexandra township in Johannesburg, also featured pictures of the deposed Libyan leader on huge TV screens. Kunene said he was inspired by Nelson Mandela's loyalty to Gaddafi as a supporter of the liberation struggle in Africa. "I'm very political," Kunene told the Guardian. 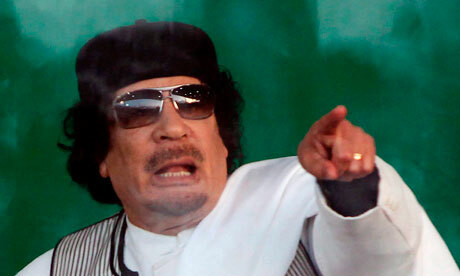 "I looked at what's happening in Libya and know Gaddafi was overthrown for oil by America and Britain. I felt that I wanted to celebrate Gaddafi as a living legend for contributing to the liberation we enjoy today. I was celebrating him as a father of the liberation struggle. Unfortunately he died the same week." Asked about his Gaddafi-style costume, Kunene said: "I felt I needed to celebrate him in the way that he lived. I loved his outfits. I don't care if they say they were tasteless. He believed in Africa. He was a man of style and he knew how to dress. "People at the party were excited. They said, 'You are forever a role model for us'. He added: "He was the only president I knew who had female bodyguards. I don't denigrate women; I respect them. Girls fight to be around me at parties because I give them a lot of career opportunities and pay them for it. Not just black girls but white girls too." Gaddafi's death "really hurt," Kunene said. "He died like a martyr. He did not run away from his country. He said he would die there and he did. "The man had long years as a ruler but I don't think the world has been exposed to the good he did for his country. It is Britain and America who create dictators because the leaders dare not step down for fear of prosecution. "The international courts have never prosecuted Britain and America for the people they kill in oil-rich countries. I don't hate British people, I don't hate American people. I just hate the governments' way of doing things in other countries." Nightclub owner Kunene's birthday party last year, costing more than 700,000 rand (or £63,000) triggered a national debate. Images of him eating sushi off half-naked young women earned him the soubriquet "sushi king" and came to symbolise the alleged excesses of South Africa's new black elite. This time, however, he claimed that there were only two men in the world who understood the protection of women: himself and Gaddafi. Thousands of township residents attended the party, the Star, Johannesburg, reported and were served African cuisine such including as dumplings, tripe and chicken feet. Kunene, a former teacher who spent six years in prison for fraud, has apparently planned no fewer than six birthday parties. He is not alone inexpressing sympathy for Libya's fallen autocrat. Floyd Shivambu, spokesman for the African National Congress Youth League, said last week: "Brother Leader was ruthlessly killed by rebels armed by Nato forces, who invaded Libya because of its natural resources." The fact that he was killed in combat was an "inspiration to many freedom fighters across the continent and the world", Shivambu added.